Decided today was the day to put hands to keyboard and do my blog. I have been so slack lately with my blog but it is a bit of a tiredness thing, as I seem to slow down so fast these days. 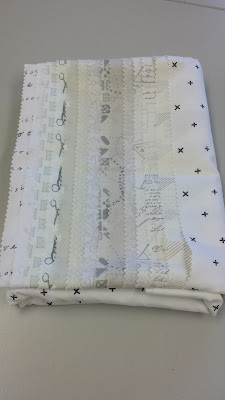 However, I have made some big decisions in my patchwork life!!! I have put aside the 365 Challenge for now. It was becoming a total obsession and nothing else was getting done. That was not what I had planned on. The plan was to get some UFO's finished, not start something else that took me totally away from that goal. So there you have it...I am back on track and really pleased that progress is now being made... here is the quilt I am finishing for a granddaughter. My friend Lynn has done a lot of the stitchery for me as she loves doing them and has no daughters or granddaughters to do girly things for. It made a big difference to my being able to see the end of this quilt that began um ? .....years ago!! These are the blocks that go between the stitchery. I have 24 to make, actually only 22 left now. I am doing these very slowly and carefully, as they are done the old fashioned way of cutting the triangles for the flying geese unit!! Long time since I have done that, and I need these to be nice and accurate. I have to say, one of the good things about having starting two mad projects that have small blocks - Farmers Wife and 365 Challenge - is that I have become a much more accurate patchworker. It has also made me slow down and make my blocks and units much more slowly, and even this small thing will increase accuracy I have found. It did used to irk me when blocks would not come out right, and I think I have finally learnt some of the answers. Fast is not always first class sewing. The other thing I did which I believe was extremely clever and funny, was at our Wine Country Quilts exhibition last month when I helped to man the Janome stand, there was an Elna Press on display. So Clare took here 24 fat eighths that had been carefully folded up for 8 years and pressed them on it! Wow, it was magnificent! If I get rich anytime soon, I'm gonna buy one for patchwork!! LOL Actually, I have to confess...I only pressed about 8 of them...my friend Catherine did the others. Mind you, it might have been the only ironing she had done during the week...just like me! (I'm gonna run now before Catherine reads this) LOL. 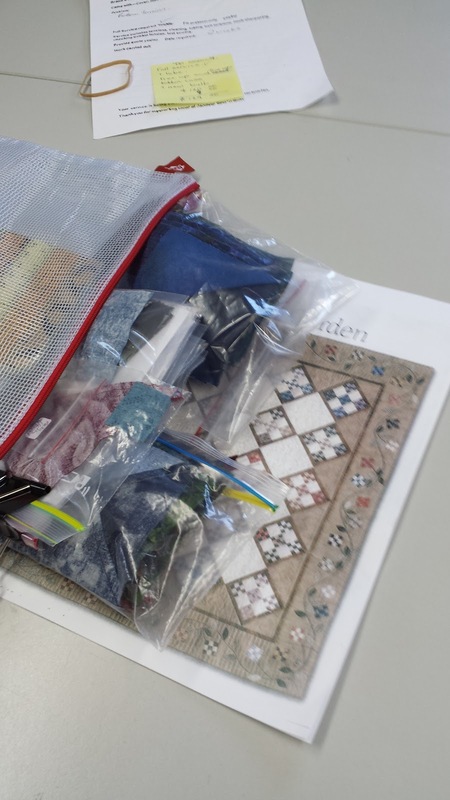 Here is my 365 Challenge stuff all neatly put into a satchel and into the cupboard. My friend Eve showed me this neat pattern that uses 3 inch 9 patches and I have already worked out that I could use the blocks I have made and make some 9 patches to add to them and "wallah" I have a quilt done. Hmmm, go to sleep brain. I like these satchels. They are transparent so you know what is in them and they stack quite nicely. Come in lots of different sizes too. Then, you'll never guess what happened!!! Some blooming fabric plonked itself right into my stash!! For goodness sake, as soon as you turn your back, you never know what might turn up!!! Okay, I'll rephrase that for you. 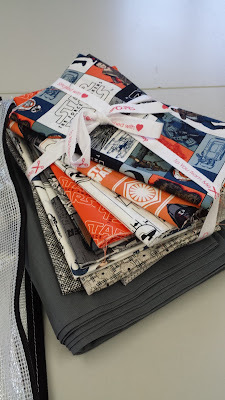 I couldn't resist the pack at the Fat Quarter Shop of the Star Wars fabric...my lovely DIL is mad about all things Star Wars, and as it is her birthday next month, what better than to buy Kea some fabric and make a quilt for Christmas with it. I let Kea have a look case a quilt was not what she wanted, but it is now in my cupboard in the queue. So, to keep this fabric company on its way to New Zealand, I felt compelled to buy this gorgeous, scrumptious, delicious collection of low volume fabrics. I mean....who could resist? This all means, of course, that I am now all fired up to get some more stuff finished, as I'm not allowed to start anything new without getting two things finished!! Who made that silly rule I wonder? I have also decided that I will only quilt my existing customer/friends quilts on my long arm, and will no longer look for new business. It tires me out too much now, and if I get a cold like I have done in March and April, I am out for about 3 weeks while I recover. Decision made, and now I'm happy with it. Besides that, I will now manage to get my own quilts quilted! In the middle of all this we have been watching our chrysalis and are so thrilled to have seen about 18 beautiful Monarch butterflies come out of their chrysalis'. this little video is of one sitting in the warmth of our autumn sunshine drying her wings before she flies away for the winter. We were like little children, and on Thursday when about seven of them hatched, we wasted an inordinate amount of time watching them. Mind you, sometimes you have to stop and marvel at these things. There is no way I could believe that this incredibly complex sequence of a caterpillar totally changing its DNA to become the most beautiful of butterflies - could have been the result of haphazard evolution. I hope the video works - as I not much good at editing these things it might be a bit long. I hope you enjoy it though. At the weekend, we had Richard, Kea and wee Marcy come to stay. Richard was back to give his Dad another hand in finishing our house off. It was so awesome that he was able to do this. Kea, Marcy and I headed off to Napier for the day. We picked up Kea's lovely parents and headed off to the National Aquarium. Not sure if we were impressed but it was interesting. The weather was stunning, so that was a plus. Here is Marcy have morning time in the "big bed" with Nana and Granddad. 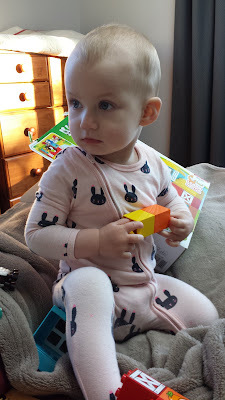 She is wondering if that Granddad fellow is friendly or not...lol. I didn't take a lot of photos as my phone was not charging properly. Kea has lots and will send me some. These weekends are so precious, and you realise that this time will never come again. The little ones grow up so fast. So there you have it - the update in the realm of the Moore's of Waipukurau. I hope you have enjoyed reading all this most interesting stuff that makes up our lives. What has been happening in your life? Lots of huggy moments I hope. Things like watching butterflies, and little girls learning to twirl, see a beautiful sunset and a chat with those who you love having in your life. Smiling at those who need a smile and seeing it making a difference to that person. Life is a gift and we should remember to treat it as a precious thing. Phew, well that was a right bit of the old philosophy he he. I think I'll go hug the cat...oops I mean my husband and see what difference it makes in his life!! here is the link to Cythia Brunz Oh Scrap. Make sure you take a look, it's great eye candy. Wow, what a lovely catch up. Interesting to hear your decisions about stitching and quilting. You are so right, one must take time to smell the roses. So nice to slow down and enjoy. 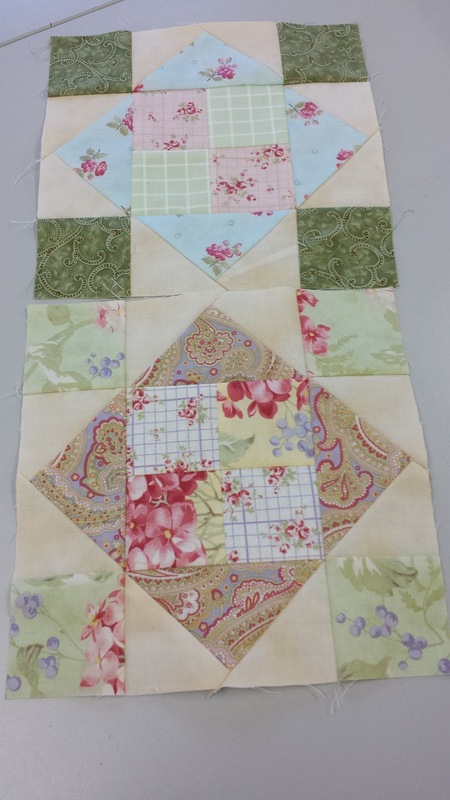 I am trying hard this year to slip personal quilts in between customer quilts. My to be quilted pile is decreasing!